As a matter of fact, what triggered this idea was an initiative by the Museum of Great War, which launched the project “Facebook 1914,” where the imaginary life of Leon Vivien unfolds. What was unique about this project is the synthesis of historical facts with story telling of what could have been said on social media from someone who was experiencing the war at the time. Following a similar logic, it is possible that if research results are to be communicated in the form of storytelling with the individual at center, awareness is expected to be greater. In the case of TIE, raising environmental awareness is a priority and therefore adjusting its work to fit the information preferences of wider audience is crucial. The first step in this process was to go over the TIE research database and assess which projects would be most relevant to current environmental trends. The research of a recent TIE fellow – Noah Cohen-Cline – on the construction of Chixoy Dam construction aftermath in Guatemala since the 1970s met the criteria. Coincidentally, over the summer 2013 World Bank announced its support to new dam construction projects in the developing world, which reaffirmed our research choice as an opportunity to teach younger generations about the benefits and drawbacks of dams based on past experience. The second step was to decide upon the story line and the key point to be underlined. Under my lead, a team of student interns -namely Denise Chin, Darius Izadpanah and Kaitlin Miller – worked on classifying the research content, historical facts, environmental consequences and social values for two months. Once they obtained a good grasp of what took place in Guatemala from the late ‘60s until today, the next priority was to define the question they were looking to answer with what they had learned. From the beginning it was clear that the story was going to be about one character and its immediate social circle, like in the story of Leon Vivien by the Museum of Great War. However it was not clear whether the hero of the story should be a man or a woman. Given the selected research is strongly related to culture, and the data depicted robust inequalities between men and women, the hero was decided to be a woman. The fictitious character ought to have a name and a face to start the story. 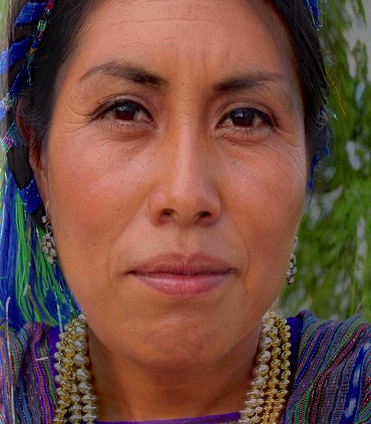 The name was the easy part having access to a Mayan names index: Maria Eme Yix Ulak. Taking into account copyrights for online images, Theresa Silver – TIE’s computer guru -created a unique face for the hero using an online software. Besides highlighting environmental aspects, the story inevitably had to touch upon political, social and economic aspects. With this multidimensional component in mind, the story stakeholders were to be identified next. The team working on the project started researching the case further and brainstormed on the questions to answer from the stakeholder angle that was assigned to them. By allocating different roles the goal was to approach the story with holistically and to ensure that the questions to be answered would be objective and covering al aspects. To capture the breadth of questions the team used a whiteboard and post it notes to gather and assess all their questions at a later stage. Within a week over 20 questions were shared on the board and the team got together to organize their thoughts. The questions posted were grouped in 7 categories and by steadily analyzing, the question the storytelling project would aim to answer was identified: Will Maria keep her cultural identity in the Chixoy aftermath? If you are curious to find out more about this pilot project visit our tumblr page: Chixoy Dam Revisited and share your comments. The story has just started…so stay tuned!